From the 1932 homesteader's who built the original cabin, to its current function as vacation destination and artist's retreat, Chulitna Lodge has maintained a magical rustic nature. Here is a breif cronological history as it has been passed down by multiple story-tellers over the years. The first apparent dwellers on this land would have been members of the Dena'ina tribe. Dena'ina is an Athabascan tribe from South Central Alaska. At Chulitna Lodge, there are footprints of what is believed to have been a Dena'ina dwelling, called a berba, which could possibly have dated back as far as the early 1800's. This house had at least 4 different rooms. It would have been made of wood set deep into the dug out. One would go down stairs cut into the earth to enter the house. Then a roof would be laid on top slightly above ground level. Click on the image to the left to view an example of what one may have looked like. The nearby Kijik River is landmarked as once having been the location for a summer fishing village for these people, possibly with a population of up to 300. It is the trail's end of the historic Telaquana Trail leading these natives from Telaquana Lake, to summer 'Fish Camp' on Lake Clark. The first known white man to establish residence at Chulitna Lodge was Bill Moore (a relative by marriage to well known local Charlie Dennison) who filed for ownership of the land in 1932. 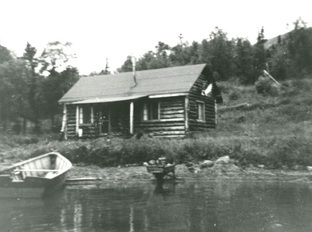 Part of the main lodge building still in use today is the original cabin built by Smith upon his arrival in 1932. He lived there with his nephew, and his nephew's wife Mary and child, from St. Louis, Missouri. They stayed until Mary's untimely death on the property in 1941. Mary was immediately buried directly at the top of the beach where the event occurred, and the husband left the next day, never to return. Her gravesite stands at that site. It has a fine white picket fence and a cross with her name and dates in Roman numerals, carved into the soft wood by a simple tool. The site has been maintained since by various owners and residents of Chulitna. There is a beautiful view of mountains in all directions, and every year Joan Silber makes a point to visit her grave and thank her for her contribution to making this magical place possible for all the women who have enjoyed it since. 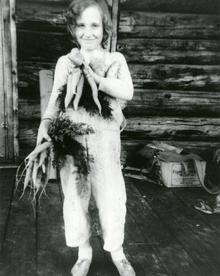 Mary Moore lived from September 16, 1909 through May 6, 1941. After Mary's demise, the property was bought by John Walatka with his wife Lillian and daughter Johanna of Dillingham, originally from Ames, Iowa. The Walatka's used the place for a summer home and also on occasion spent time in the winter ice fishing and simply enjoying the beauty. John Walatka and notorious aviator Babe Alsworth were friends and John soloed Babe for Babe's flight checkout. 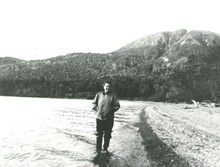 In 2005 at the age of 69 Johanna Walatka, now Johanna Bouker, told her friend John Branson, the official historian for Lake Clark National Park, that she would like to revisit. She and her husband Dave returned to a place she hadn't been to since she was 10 years old. 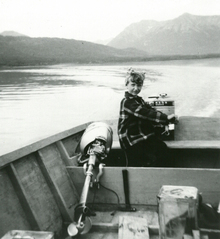 Recalling her delightful childhood at Lake Clark, from 1942-1963. She told memories of her parents, both very tuned into nature, and very careful and thoughtful about using only what they needed and respecting all the animals, plants, as well as the areas native peoples. Her mother considered the strawberry patch originally belonging to the Dena'ians and would not pick any berries until the natives had come by and taken all they wanted first. They dammed 'Fridge Creek' with a circle of rocks. Then they would fish the Lake and put their catch in the small pool of water they had created, where the fish continued to live, and they would eat from the fresh cache as needed. At the end of the season when they no longer needed more fish, they would open the dam and let the remaining fish swim freely back into Lake Clark. One winter night a lynx had broken through the ice of the pool and helped itself to one of the fish, a large Pike with a tumor on its side. To this day, Johanna felt bad that the fish that was suffering with the tumor should also suffer this fate instead of going free again. Her sensitivity to all peoples and creatures is still very evident. The Walatka family did a number of improvements to the property over their time there. The original cabin built by Smith was moved down the hill, log-by-log, to the lake front where it resides today as the main lodge where our kitchen, library, and dining room are. (The building was moved with help from Chester Whitehead and Joe Thompson.) The original 'footprint' of where that cabin had been can still be made out on the hill above the 'kids cabin'. Walatka built an additional private room off the back of the main cabin just for Johanna. As well, the Walatkas built the woodshed (which is now used as a garden shed) and a meat house attachment to the main cabin (which is now the laundry and utility room.) They had a hand pump on the west side of the building drawing water from a well just outside the building. This well was uncovered in 2004 reconstruction. It was at least 14 feet deep, and clearly had originally been deeper. It has now been filled in to prevent the foundation supports of the lodge from sinking into the ground. When they left the cabin at the close of the summer of 1958, neither Johanna nor her mother imagined that they would not return the following year. Her mother passed and they never returned. 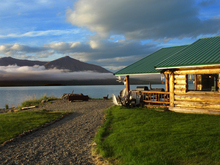 John Walatka's second wife did not have an interest in the Lake Clark retreat, and in 1963 he sold it for $4,000. With the money he bought a supercub airplane. Glen Andrews and his wife Claudia bought the lodge from the Walatkas in 1963. Only owning the property for eight years, they were first to give the property its current name 'Chulitna Lodge'. Also, they built the airstrip on the neighboring property before native claims to land. It has been rumored Andrews had a reputation as a wild man. During his ownership, some of the other beach cabins were constructed and tales have been told of one of Andrews' expert log cabin craftsman who showed Joan Silber a bullet hole in the back of cabin #1, telling of the day he got mad at Andrews and they chased each other around with guns. Despite this, they were also known as being organized and excellent cabin makers. Glen and Claudia put a 5 page article about Chulitna and Bear Hunting in a 1967 issue of Alaska Sportsman titled 'Chulitna Brownie'. Andrews died in a plane crash with a woman in the plane in 1971. 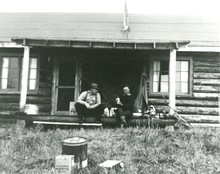 Chulitna Lodge was purchased from the Andrews' estate by Hank Rust who ran it as a commercial hunting and fishing lodge, with the assistance of Ken Owsichek and Bob Tracy from Nondalton. Owsichek piloted for Rust and helped improve buildings for Chulitna Lodge. 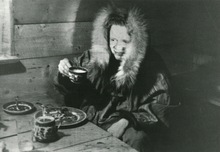 Owsichek's wife, Lorane did cooking for Rust while Ken piloted. Lorane painted all the little decorations of mushrooms and flowers on the smooth surfaces of chunks of Cottonwood Bark that are still scattered about the Lodge. Eventually, in 1976, Ken Owsichek and Lorane opened their own fishing lodge in Port Alsworth called Fishing Unlimited. During Rusts ownership the large dining room table was built. Some say by Jack Ross and other say by Andy Beluta. Also during this time the enormous front room was added on, as well as the front porch. Large rocks were hauled in to construct a fireplace in the center of the (then) new living room. In 1977 the real estate/air service partnership of Walt Hanni, Irv Terry, and Steve Anderson bought the lodge creating a limited partnership, with 15 partners and rust remaining as one of the partners. Under Jimmy Carter's presidency, the region was declared a National Park and Preserve in 1980. So just 3 years after the purchase, suddenly a handful of acres gained over 4 million acres in buffer. Among those partners were Drs. Joan and Sherman Silber, and 'Bud' Wilson. Wes and Darlene Pickard, with their 7 year old son Brian, lived at Chulitna Lodge as year-round caretakers from 1983 through 1986. “In the summer time my family would play host to the Chulitna share holders along with their families and friends. We would throw parties with bonfires and fireworks, lead nature hikes to the Kijik River, played bumper pool (of which I was resident champion) and many other activities that never grew dull. Many of the visitors, like the Silbers, became friends and we looked forward to seeing them each year. When we were not hosting guests, my family lived much like pioneers of old though we did have running water in the summer. My father spent most of his time locating and hauling dead trees and chopping wood to prepare for the looming winter. My mother maintained a large garden and our chickens and ducks. We would put up several hundred salmon every year that we caught in a gill net off the point in front of the lodge. All in all we ate a lot of salmon! 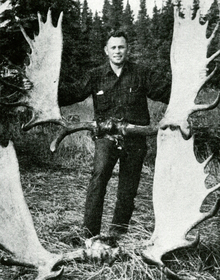 In the fall my father would shoot a single moose, that would provide the meat we depended on for the rest of the year. One of my parents would fly to Anchorage to pick up food staples and supplies to get us through the winter and I would begin homeschool. As winter approached, daylight would begin to rapidly decrease. We had limited electric lights and would hook them up to car batteries we would recharge once a week, that is if my dad could get the old massive generator with instructions written in Chinese cranked up. The winter was a quiet time. We would close off the large living room of the lodge and hunker close to the always fired wood stove. I played lots of board games and cards, read countless books, wrote stories and drew cartoons. My father had a trap line, and my mother would sew the furs into hats and mittens to help protect us from the sometimes 40 below zero temperatures. Frozen pipes in the winter meant no running water so we made use of the outhouse and sauna. The water we collected came from a hole in the ice on the lake. By the end of the winter the ice thickness had built up so deep we had to use a rope to dip water much like a well. We traveled around by snow machine mostly but one winter we actually had a dog sled team of over a dozen dogs and communication was very different before the days of internet and satellite phones. The only form of electronic communication was a CB radio which could reach friends across the lake who could make phone calls for us. My younger brother, Andrew, was born in 1985 and caring for an infant in the bush was difficult. After a year my parents decided to move us back to civilization and we settled in Anchorage. The Silbers lived in Anchorage as newlyweds from 1967 - 1969 where Sherman was a surgeon in the Public Health Service at the Alaska Native Hospital, and Joan was an English and Journalism teacher at Mears Junior High. 'Bud' and his wife at the time, Bobby, were newly moved to Anchorage from Denver, and both school teachers in the Anchorage Borough. The two couples met and became closest friends. The limited and general partners came often and enjoyed Chulitna Lodge for many summers, sometimes bringing groups of 8-12 people each. 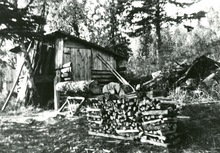 In those days, there still existed the old sauna that was located up 'Fridge Creek' in a clearing just above 'Steve's Cabin'. The old sauna was a small, squat log cabin divided into two rooms, a dressing room and the sauna itself. The interior walls in the sauna were lined with pink insulation covered by plastic sheeting. There were 2 benches hugging one corner and an old rusty oil drum wood stove surrounded by rocks, hugging the other. Large white enamel tubs would be filled with water and set to heat on the oil drum and large dented aluminum pitchers would be filled with cold water and set near by to cool down as needed or splash on the hot rocks to create steam. The cabin was situated right alongside a dug out pool of glacial fed water, and sometimes when the sauna would get hot enough, it was considered the "game thing to do" to run outside and plunge up to one's neck in the mud bottomed pool of water. Joey Silber was especially fond of this act. The Silber family was one of the few limited partners who came to the lodge every year since the partnership was formed. 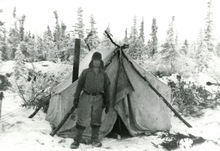 Each year they would bring their three boys, David, Steve, and Joe, and numbers of other guests to enjoy the pristine setting and experience being in the true Alaska wilderness. In 1995 'Bud' and Joan and Sherman bought out the other shares creating their own partnership. This is a living account. There are many other projects and builders and people who have visited and loved this magical spot. Any who wish to add (or remove) any words herein, please send a note and I will oblige.